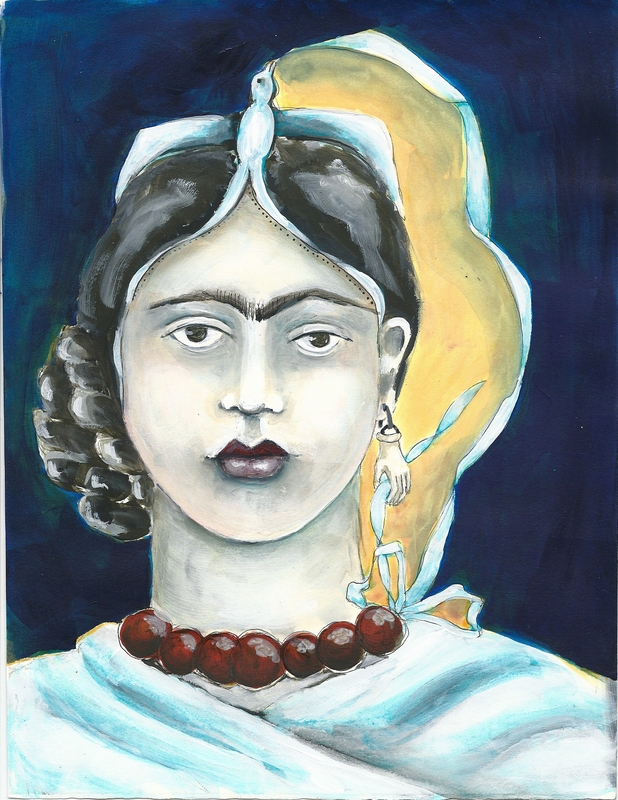 Creating ‘Frida’ inspired work makes you consider the elements you add and how they will tell your story. Here I used elements found in her work in a new way. I love the little hand earring, but I’m a ‘doer’ so for me the hand had to be doing something. I’m busy getting ready to head to CA next week to teach at CREATE. I hope to see some of you there:-) I will be doing a book signing June 2nd at 4:30 so be sure to stop by and say hi! Also Artful Gathering will begin right after I get home on June 6th! This is the only new online workshop for 2012, so if you’re at all interested don’t delay in signing up as registration will close 2 weeks after class opens on the 6th. Many have asked if they can just purchase the DVD and what is on the DVD. The DVD is only available for class attendees and it is the complete set of videos from the workshop! So even if the time of Artful Gathering doesn’t work for you, you can join and download printed materials and get the DVD to go through the workshop when it’s convenient for you. Wow! It’s hard for those of us behind the scenes at ARTFUL GATHERING to believe the day is finally here!! We’ve been busy for months working on our workshops, shooting, editing, turning videos into DVD’s, writing up handouts, gathering awesome raffle prizes, and getting the classrooms all set for you! I hope you’ll consider joining me for my brand new online class! This is the only drawing faces class that I’ll be teaching live or online in 2012, so don’t miss the chance to participate in a real time online setting and then also have the opportunity to revisit the workshop through the DVD and handouts anytime you like! 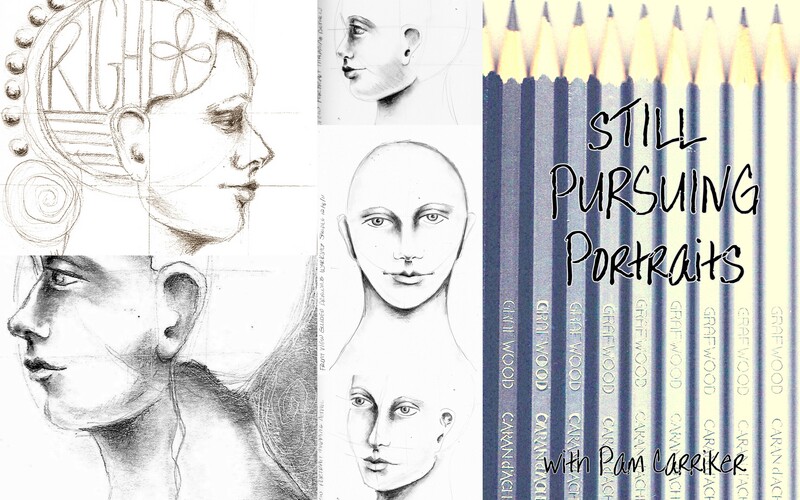 A few years ago, a couple hundred students began a journey with me called Pursuing Portraits. I don’t know about most of them, but for me, my pursuit of drawing and painting portraits continues on. I’ve moved from cute, stylized faces to more accurate, realistic portraits. That is where my journey has taken me and along the way I’ve learned, through teaching numerous workshops, how to dissect a face and demonstrate easy ways to make a ‘face map’ to guide the artist in creating a face with the correct proportions. For the first time, I would like to share all of this with you! This workshop will cover creating portraits from sketching to painting, with some fun new mediums thrown in for even further exploration. So you didn’t take Pursing Portraits the first time? This class is brand new, and will benefit both those who took my first workshop and those who did not. 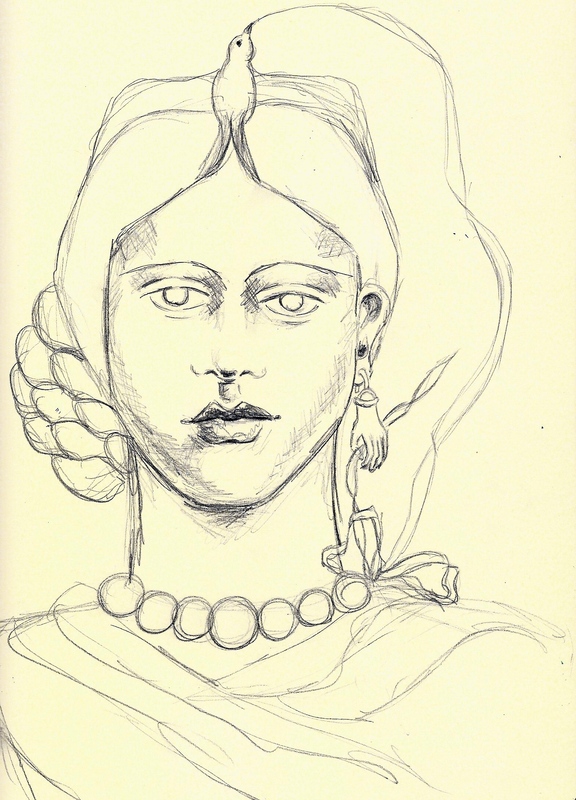 Daily exercising of the ‘sketching’ muscles is highly encouraged as in lessons 1-3 we will explore drawing a face from front, side, and ¾ views. 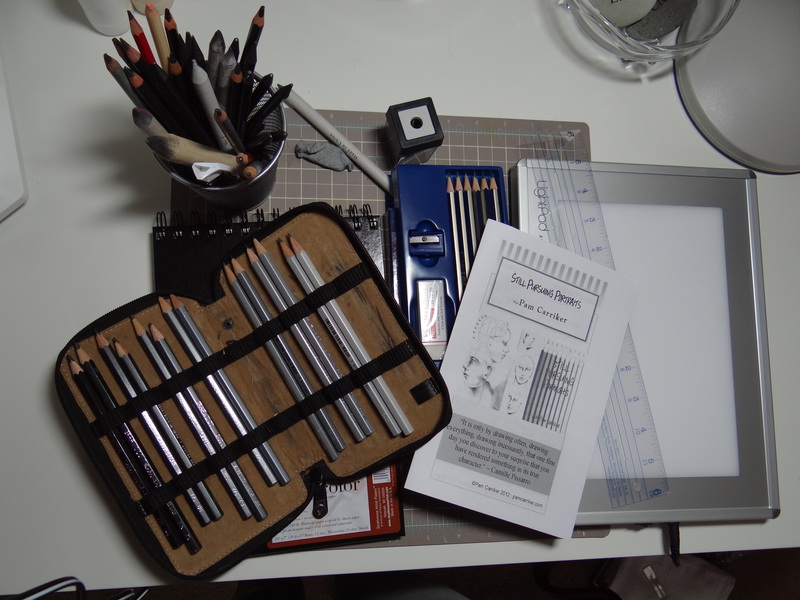 Mapping, shading, various pencil techniques, and an easy method of transferring sketches to rapidly improve drawing skills, will be demonstrated through videos. PDF downloads of worksheets will accompany each of these lessons so we can practice without fear. We will work in journals to enhance the atmosphere of learning and to see our growth. Creating faces takes practice and if you put in the time I can guarantee you will see improvement and growth in your work. 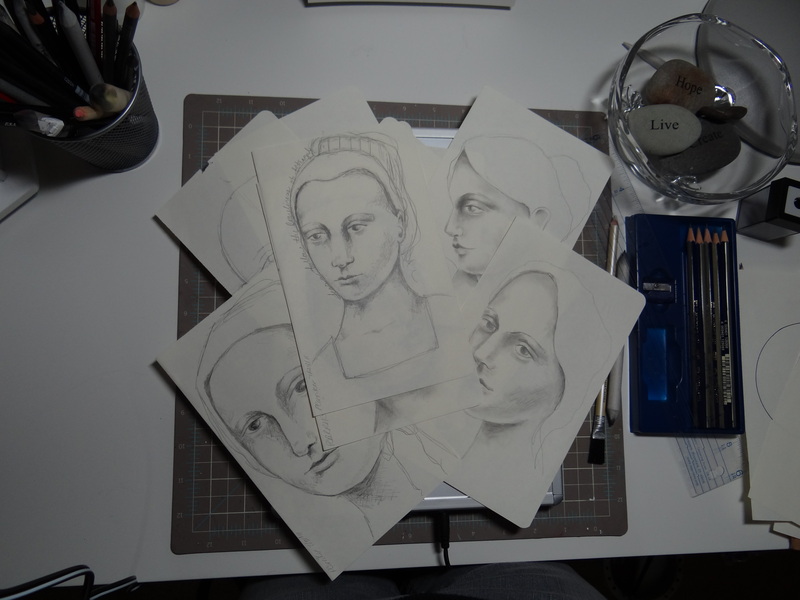 When we have practiced our hand at drawing, we will then move on to painting portraits using a variety of mediums. Water soluble crayon, my new Liquid Pencil Sketching Ink, and acrylic paint will all be explored in our journals. 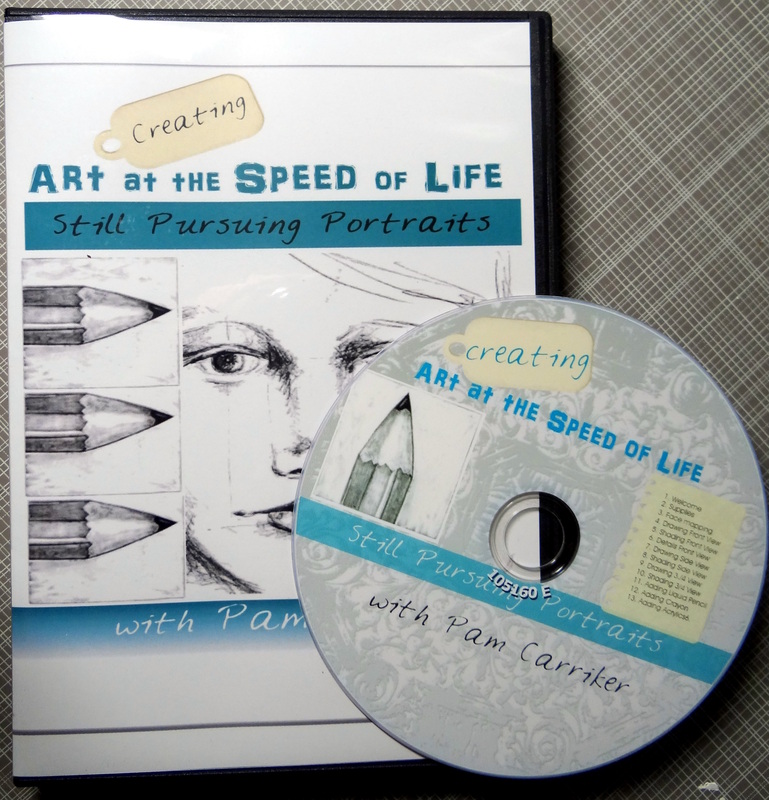 This 8 week workshop will include over 100 minutes of video instruction, PDF download worksheets, video and written instruction on drawing a face from full on, profile, and ¾ views, shading, water soluble crayon, Sketching Ink, and acrylic paint techniques. Everything you need to get started or to enhance your journey as you continue your Pursuit of Portraits. Final Destination on the Artful Gathering Blog Hop! Well, it’s finally here, the last stop on the Artful Gathering Blog Hop!!! If you’ve collected all of the clues you can enter to win the prizes!!! Good luck to you all! Our last and final blog destination belongs to and this is the final location where you’ll find the last TWO words left in our secret word collection. Pick up the last two words here. Bring ALL your secret words here. Winners will be drawn at random through random.org. One winner will be chosen to win the $200 e-card gift certificate to Jerry’s Artarama, and two winners will be chosen at random to win a $25 e-gift card to Jerry’s Artarama. Please leave all the necessary contact info with your secret words in the moderated comment section of Artful Gathering’s Hop Page. Thank you so much for hopping with us and we look forward to seeing you at Artful Gathering 2012. Special thanks to Jerry’s Artarama, Artful Gathering’s prize sponsor of the blog hop event. Good Luck, and thank you for playing! You can hop along with us until the final destination blog is reached, and where ONE Grand Prize winner will be chosen at Random for a chance to win a $200.00 e-gift card from Jerry’s Artarama!! !Two Runner Up winners will also be chosen at random for a chance to win a $25.00 e-gift card from Jerrys. Next Stop on the Artful Gathering Blog Hop is Here! I’ m so thrilled to be part of this event. I can tell you the teachers have been hanging out in the ‘Teachers Lounge’ for several months now as we have worked on preparing our classrooms and I’ve so enjoyed the camaraderie and genuine friendly atmosphere at Artful Gathering. It’s a great sign of the fun ahead as we put the finishing touches on the classrooms. 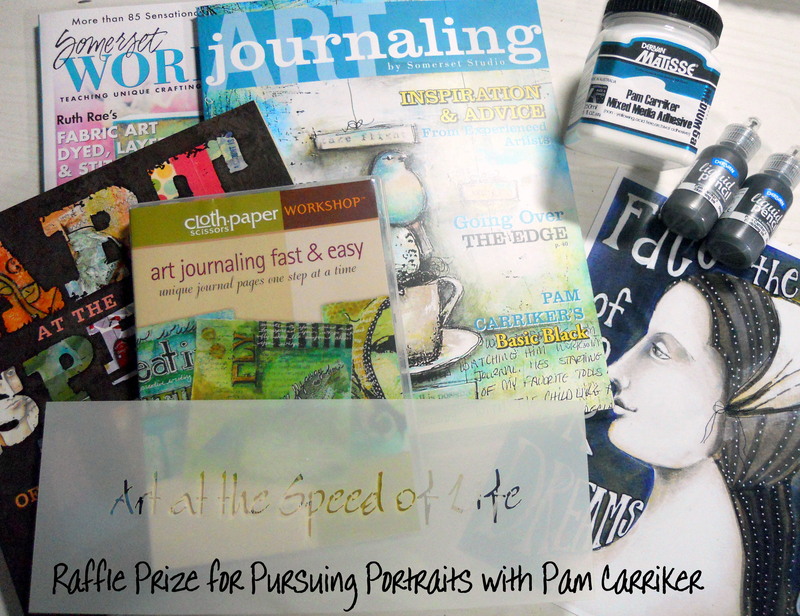 I’m the Spotlight Artist for The Artful Gathering Blog Hop! Follow along with me for fun, creativity, and a chance to win a$200.00 e-gift card from Jerry’s Artarama! If you would like to hop with us and meet all the super awesome Artful Gathering 2012 Art Instructors, and have a chance to win a random drawing prize in our random drawing, then hop with us! Each week, I will announce the blog for you to visit, and off you go to meet them, and to pick up the newest secret word. Your chance to win prizes…. Three winners will be randomly drawn. One for the $200.00 e-card to Jerry’s, and two runner’s up for the 25.00 e-card to Jerrys! Next week, I’ll announce the next person to hop to. Good luck!! !